Denny Hamlin finished third in Saturday night’s NASCAR Sprint Cup Series race at Kentucky Speedway, leading three times for 58 laps and stretching his fuel to the checkered flag en route to his eighth top-five finish in 17 events this season. Staying out under the race’s final caution on Lap 210 shortly after pitting for the final time for tires and fuel, Hamlin restarted second behind eventual winner Brad Keselowski. Hamlin had to conserve gas on the final run, crossing the stripe third behind Keselowski and Kasey Kahne. 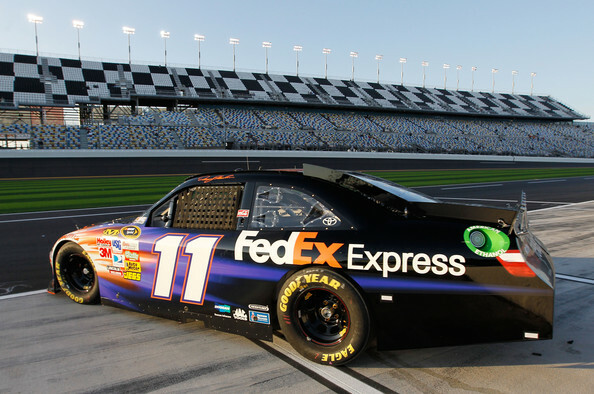 Hamlin started third in the #11 FedEx Express Toyota and remained in the top-five throughout the 267-lap event on the 1.5-mile oval. He took the lead for the first time on a Lap 130 restart and led all but two laps until Lap 187. The finish moves Hamlin up two spots to fifth in the NASCAR standings following Kentucky, 68 points behind leader Matt Kenseth with nine races to go before the Chase cutoff. The Sprint Cup Series heads to Daytona International Speedway for Saturday night’s 400-mile event on the high-banked, 2.5-mile track. Hamlin is making his 14th start at Daytona this weekend. His best-career finish at Daytona of third came in the July 2008 race, and he finished fourth in this year’s season-opening Daytona 500. The 31-year-old Virginia native led a race-high 57 laps in February’s ‘Great American Race,’ and has led at least one lap in nine of 13 Cup Series events at the ‘World Center of Racing.’ Hamlin finished 13th in last summer’s Daytona race, surviving a variety of incidents during two ‘green-white-checkered’ overtime attempts before being sent spinning through the infield grass to the checkered flag. The FedEx Office store in Bentonville, Ark., currently leads the company’s President’s Club program and will be recognized with its “1588″ code numbers on the b-post of the #11 FedEx Office Toyota this weekend. Are you happy with NASCAR’s current restrictor-plate program?